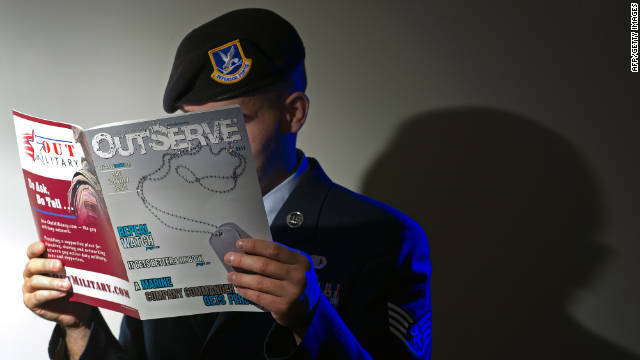 A member of the Air Force reads a copy of OutServe, a magazine for lesbian, gay, bisexual and transgender military personnel. For nearly 17 years, gay and lesbian soldiers of the U.S. military were expected to deny their sexuality under threat of dismissal as part of the policy known as "don't ask, don't tell." The repeal of the policy on September 20, 2011 stirred controversy, and inspired passionate arguments on both sides of the issue. “The report confirms what the research suggested all along,” said Professor Aaron Belkin, lead author of the study, and director of the center. According to the report, the authors of the study were scholars on the issue of gays in the military, including scholars from the U.S. Military Academy, U.S. Air Force Academy, U.S. Naval Academy and U.S. Marine Corps War College. Several members of the study team advised the Pentagon’s 2010 DADT working group on repeal, and one member, Col. Gary Packard, Jr., a professor at the US Air Force Academy, led the group that drafted the Defense Department’s plan for implementing repeal, the report said. Researchers interviewed activists and experts who publicly opposed repeal, as well as “watchdog groups” on both sides of the debate, thinking that these groups had a proven record of keeping a close eye on any possible issues within the ranks, or problems with individual service members, according to the report. “Such organizations maintain large formal and informal networks of active-duty personnel and have considerable experience in ferreting out and reporting incidents of abuse and other disciplinary breakdowns,” the report said. Researchers also analyzed media coverage of the repeal over the past year, and consulted active-duty service members, including interviews with soldiers from all branches of service, heterosexual, lesbian, gay and bisexual. “No one is more qualified to comment on the impact of DADT repeal than active-duty service members, who live their lives and perform their duties in the context of the new policy of open service,” the report said. An enlisted soldier at a military university told researchers that when DADT was in effect, his unit mates would use degrading, anti-gay language, “almost absent-mindedly and with little consequence,” but that after repeal, he said, “it was kind of a big deal for two weeks,” as soldiers considered what it would mean for their comrades to be openly gay. While the Obama administration has used the repeal of “don’t ask don’t tell” as a talking point and gained support among lesbian, gay, bisexual and transgender voters, two planks in the Republican Party’s 2012 platform also appear designed to score political points. The first says Republicans will "reject the use of the military as a platform for social experimentation," and another says, the party will conduct an "objective and open-minded review of the current Administration’s management of military personnel policies and will correct problems with appropriate administrative, legal, or legislative action." Hi there, You have done an excellent job. I will certainly digg it and personally recommend to my friends. I'm confident they will be benefited from this website. One year later, no overall negative impact on military after repeal of DADT? Did the study research how the military is dealing with bearthing and showers? So this "study" tried to talk to 553 retired Generals and only 13 responded. Seems like they need to get a better sample size to conduct real research. Find out how many still follow the DADT and how many came out and see what the outcomes were or why they kept their preferences to themselves. And yet only 13 had the ba lls to admit they were wrong and not 1 of 553 could give a factual example that the end of DADT caused any harm. Sounds like you are the one with an agenda of hate mongering. Just admit you are wrong... You will sleep better. china and russia must luanch there nuclear weapons detonating and vaporizing dublin ireland to dust. god bless the chinese nuclear submarines they are the only weapon that can remove this evil british empire. Can you stop?Learn some grammar while your at it. Says the f*****g retard who can't spell "you're".